The obesity epidemic is affecting not only people but their pets as well. More than half the dogs and cats in the U.S. are at least overweight, and one out of five is obese, according to the Association for Pet Obesity Prevention. Just like their human companions, excess weight can bring on a host of health problems for pets. Being overweight can increase risk of osteoarthritis, insulin resistance, type 2 diabetes, high blood pressure, heart and respiratory disease, cranial cruciate or anterior knee ligament injury, kidney disease and some cancers. It can decrease an animal's life expectancy by up to 2.5 years. Banfield Pet Hospital, which operates more than 850 veterinary facilities across the U.S., found that dog diabetes rose 32 percent between 2006 and 2010, while the number of cats with the disease went up 16 percent during the same time frame. Senior veterinary surgeon Sean Wensley previously told CBS News one of the biggest issues is that weight problems can affect a pet's quality of life. "For cats, you'll see they're reluctant to play and they are unable to enjoy life," he explained. Without a scale, you can tell if your pet is overweight by looking a few key factors, known as body conditioning scoring. Wensley said if you look from above the animal, you should see where their waist comes in below the rib cage near the pelvis. You should be able to feel their ribs, but not see them. They also shouldn't have excess abdominal fat if they are a cat or fat near the base of their tail if they are a dog, because this signifies they have a lot of unhealthy fat around their internal organs. 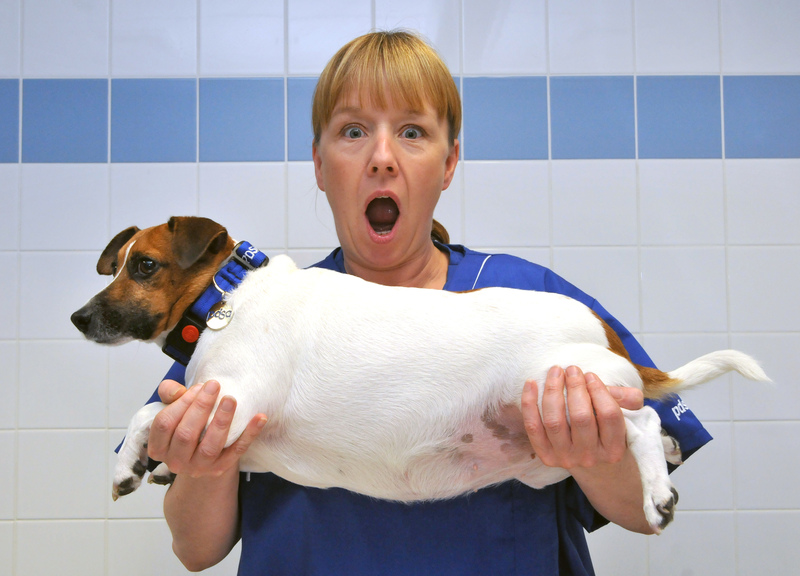 The U.K. organization the People's Dispensary for Sick Animals (PDSA) has an annual contest known as the Pet Fit Club to help encourage owners of overweight pets to help them lose some weight. The most recent winner was a Jack Russell terrier named Ruby who slimmed down from 20 pounds to 13.2 pounds. "This is a fantastic slimming success story - well done Ruby!... The weight loss means she will feel much fitter and happier, and her life expectancy is likely to be longer now than she has shed the excess weight," PDSA senior veterinary surgeon Elaine Pendlebury said in a press release. How do you get pets to lose the extra weight? One study suggested that when cats are given small, frequent feedings with the appropriate amount of food to maintain a healthy weight, along with more water to drink, they also start exercising more. Wensley also suggested that pet owners should cut down on treats and other food outside of meals. Most pet food these days is balanced to include all necessary nutrients, so anything else you give them -- whether it comes from the table or from a treat jar -- is all extra calories. "A little piece of cheese for a cat is like giving a human a hamburger," he said. Pet owners should follow exact feeding guidelines and measure out portions, not just fill the bowl. Finally, taking your pets for walks and playing with them more actively can let out pent-up energy and give them a good workout. Plus it's good for you, too. Studies have shown that people who walk their dogs are much more likely to achieve the recommended 30 minutes of exercise a day.